Click here for other Direct Access related articles. Microsoft Direct Access 2012’s basic architecture options. Will add load balancer in next version. Let me know if I got something wrong or any other good suggestions. Microsoft Direct Access – When what type of IPv6 Transition Technology used by Direct Access Client? Direct Access server can be configured for all three internet IPv6 Transition Technologies i.e. 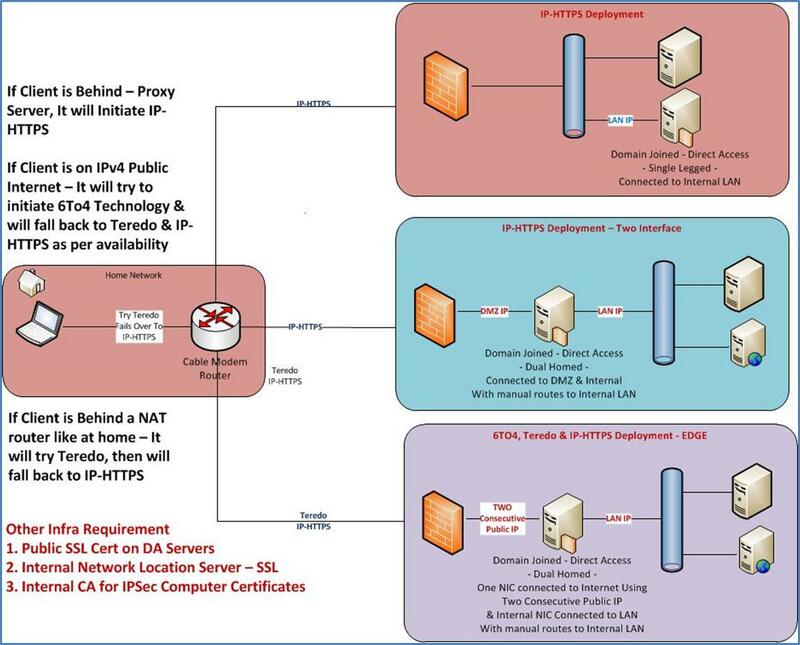 Teredo, 6to4 & IP-HTTPS. As per server config group policy get applied on clients. So if server is configured for all 3 transition technologies & GPO is applied accordingly, when what type of IPv6 transition technologies is used by direct access clients??? This post describes the same. These are my screenshot notes from TechNet Article. Microsoft Direct Access – How DNS64 & NAT64 works? As I said in my previous article Direct Access is an IPv6 only technology; Direct Access clients talk to Direct Access Server using IPv6 technologies. 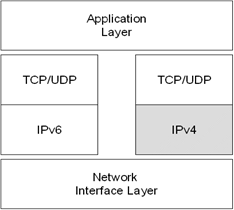 (Don’t forget this communication happens using IPv6 transition technologies i.e. 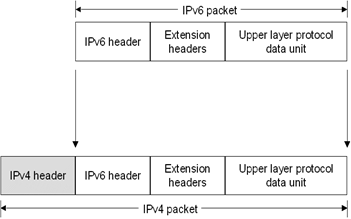 IPV6 encapsulation in IPv4 packets.). As client to server communication happens using IPv6, Name lookup also happens using IPv6 & AAAA query. So if a internal server has IPv6 address it is easy for the client to start communication. But if internal server is only IPv4 configured, how it will communicate. This is where DNS64 and NAT64 come into the picture. So NAT64/DNS64 are needed when you want to have IPv6 communication over IPv4 network. For other way round look forward to next article. So IPv6 enabled DA Clients send an IPv6 host resolution query (AAAA Query- Quad A query) to Direct Access Server. In Direct Access Server DNS64 (DNS 6 to 4 Proxy) accepts this query & contact internal corporate DNS server as per Direct Access Servers own internal DNS IP Address config. Internal corporate DNS server hands over either IPv6 or IPv4 or both addresses for the internal destination application server to DNS64. This depends on what kind of address internal app server is registered with internal dns server. If DNS64 receives both IPv6 & IPv4 address it hands over the IPv6 address to DA Client. DA Client starts communication to that IPv6 address of destine application server. If DNS64 receives only IPv6 address from the internal Corporate Server, it hands over that IPv6 IP to the Direct Access Client. DA Client starts communication to that IPv6 address of destine application server. If DNS64 receives only IPv4 address from the internal corporate server, it cannot hand over that to Direct Access client; because DA client is not aware of IPv4 address. So it handover that address to NAT64 service in the same server. In Direct Address server NAT64 captures the IPv6 communication packets as it is carrying it’s NAT64 prefix. Then NAT64 removes its proxy and creates an IPv4 payload of same data and forwards to the destination application server. When NAT64 receive a reply for that packet, again it creates IPv6 address using prefix & forward to Direct Access client & continues. Just to remember; When Direct Access Server is load balanced, these translation packets carry same nodes address so reply come to the same node, which did the translation. In Windows 2008 R2 version Direct Access, DNS64 & NAT64 were not inbuilt so had to use UAG or any other 3rd party product and in UAG we have to configure NAT64 prefix. But in Windows 2012 NAT64 &DNS64 are integrated, so we don’t need UAG, Also we don’t need to configure any separate prefix per say. DirectAccess uses IPv6 with IPsec to create a secure connection between DirectAccess client computers and the internal corporate network. However, DirectAccess does not necessarily require connectivity to the IPv6 Internet or native IPv6 support on internal networks. These IPv6 transitioning technologies provide automatic tunneling between two Dual-Stack devices; here tunnel doesn’t mean a typical vpn like tunnel. Tunnel refers to encapsulation and they also auto assign IPv6 address to the participating hosts. It provides address assignment and automatic tunneling for unicast IPv6 connectivity across the IPv4 Internet, even when IPv6/IPv4 hosts are located behind one or multiple IPv4 NATs. 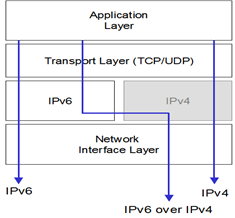 Known as IPv4 NAT Traversal (NAT-T) for IPv6. To traverse IPv4 NATs, IPv6 packets are sent as IPv4 UDP messages. Due to nature of UDP Teredo provides more performance than other transition technologies. 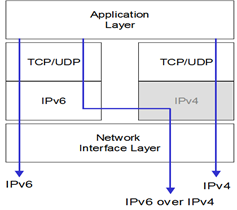 It is designed as last resort transition technology for IPV6. It only used where native IPv6, ISATAP or 6To4 connectivity is not possible. Like other extranet IPv6 transition technologies, IP-HTTPS auto assigns globally routable IPv6 address to IPv4 enabled hosts. IP-HTTPS establish connectivity by tunneling IPv6 packets inside an IPv4-based HTTPS session. IP-HTTPS is used instead of HTTP so that Web proxy servers will not attempt to examine the data stream and terminate the connection. IP-HTTPS implementation in Windows 2012 Direct Access is different from Windows 2008 R2 Implementation. In Windows 2008 R2 Direct Access with Windows 7 clients also use IPSec encryption for data transfer. Resulting IPSec Encryption inside SSL Encryption tunnel. This brought more overhead & performance issues. Windows 2012 implementation brings more enhancement & performance to the protocol by implementing SSL with NULL encryption. Null encryption allows for authentication to take place during the SSL handshake. Once the SSL handshake has completed all messages flow without being encrypted over that socket. In Windows Server 2012, a new feature solves issues while Direct Access client is behind a proxy server. Specifically, the user can configure IP-HTTPS to work when behind a proxy that is not configured using WPAD (Proxy Discovery) and IP-HTTPS will request and provide the proxy credentials needed to IP-HTTPS request authenticated, and relay it to the DirectAccess server. IP-HTTPS can use a valid Public/Private SSL cert generated from CA or Self Signed Certificate. Windows 2008 R2 Direct Access deployment doesn’t provide these two options out of box. And Direct Access needs these two features to work. Microsoft UAG (Unified Access Gateway) provides these two options & you have to configure little bit. If you don’t have UAG; you need a 3rd party component to deploy them. Windows 2012 Direct Access provides these two features out of box & you don’t need to configure anything. NAT64 is a network translation service, which provides IPv6 to IPv4 Address Translation i.e. 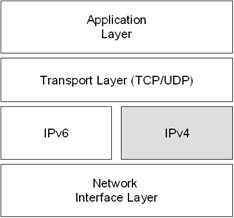 it translate Direct Access Clients IPv6 traffic to IPv4 to reach internal servers; not other way round i.e. it is Unidirectional. So any intranet server needing access to Direct Access Clients needs to have their own IPv6 Address using static assignment or ISATAP technology. DNS64 is a DNS Proxy service provides DNS service for Direct Access Clients. DNS64 takes DNS resolution request from IPv6 client and query to corporate dns server & return the address. In case query resulted a IPv4 address, it take help from NAT64 to generate a corresponding IPV6 address and handover to direct access client. See other article to understand how NAT64 & DNS64work hand in hand. I was running out of space in NFS stores, which are assigned to VMware farm. I created two LUNs added to ~filestorage Storage Group. Later on while troubleshooting found all disks (LUNs) assigned to ~filestorage Storage Group are only attached to one data mover server i.e. Server_2. As my two new luns are not showing I removed them & did couple of scanning but no luck. Well he logged me into VNX Debug URL (https://StorageProcessorIP/debug) & then we ran “Force full poll” in both storage processor and after completion storage processor scan in nasadmin shell. It helped to rebind those LUNs to both data mover servers. 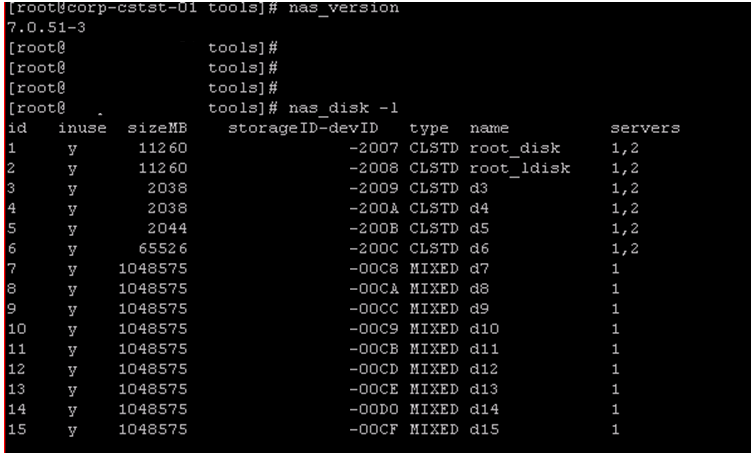 Ten added my two new luns & checked status with “nas_disk -l“, they are still unassigned to server_3. After running a storage scan they automatically assigned to server_3. And I am able to create new NFS stores.